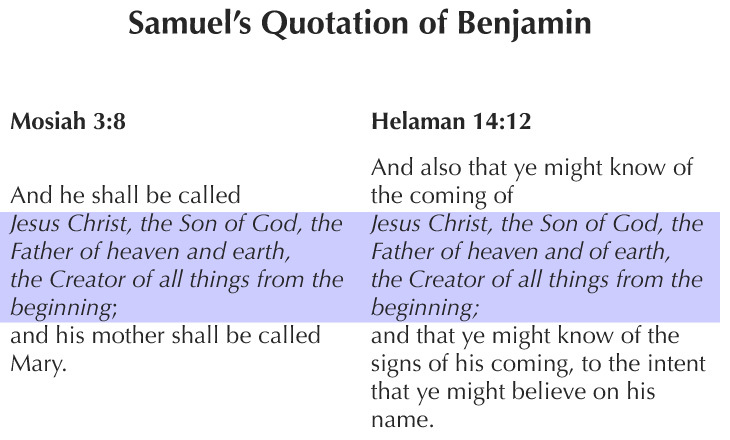 Though Samuel did not explicitly state that he was quoting Benjamin, his words in Helaman 14:12 are a precise repetition of Benjamin's key words in Mosiah 3:8. Samuel could have known of the teachings of Benjamin through the ministry of Helaman's sons Lehi and Nephi to the Lamanites. Because Helaman stressed that his sons should remember the words of Benjamin (see Helaman 5:9), it is likely that Lehi and Nephi used exact quotes of Benjamin in their proselytizing. In Mosiah 3:8, Benjamin revealed to his people, in connection with their covenant with God, the name and titles of their Lord God Omnipotent. This took place at Zarahemla. A century later, Samuel the Lamanite stood on the walls of that same city and called the people to repentance. His use of Benjamin's covenantal language probably struck them especially powerfully.